Media around the world condemn as shocking the revelations in a US Senate report that the CIA used brutal techniques to interrogate al-Qaeda suspects. Traditional critics of US foreign policy, like the media in China, Russia and Iran, use the report to accuse Washington of not having the "moral right" to condemn the human rights records of other states. Some commentators suspect the Democrat administration in the White House of making the revelations public just in order to attack its Republican opponents during whose rule the interrogations took place. "Perhaps the US government should clean up its own backyard first and respect the rights of other countries to resolve their issues by themselves," suggests China's state-run Xinhua news agency. "America is neither a suitable role model nor a qualified judge on human rights issues in other countries… including China," says the commentary. Although the story features prominently mainly in the international news sections rather than on the front pages, criticism of CIA actions is outspoken. "The report will be powerful evidence that will totally unveil the ugly human rights face of the US and will serve a heavy blow to its credibility and international image," predicts pro-Beijing Hong Kong paper Ta Kung Pao. "CIA torture report reveals chilling torture techniques," says a headline in the Peninsula Morning Post. In Russia, state-run Channel One TV said in its news bulletins that the Senate report "makes people shudder". "This is a real bomb," added a reporter, detainees "were tortured with an inquisitor's ingeniousness". Some media are suspicious of the White House's true intentions for revealing CIA torture techniques. "This belated report has finally been released thanks to Obama's support, because of his need to attack his opponents in the Republican Party and thanks to letters by human rights experts at the UN," opines a commentator in Hong Kong's Ta Kung Pao. Russian state-owned news TV channel Rossiya 24 also highlights differences between President Obama's Democrats and their opponents. The TV showed former Republican President George W Bush praising the CIA and saying that if the report diminished the contributions of "patriots", then "it is way off base". The end result of the senators' work is "a document that fails to assign any blame for the abuse of detainees," quipped a presenter on Russian English-language international broadcaster RT. Iran's international-facing English-language Press TV also stated in its news bulletins that "despite the report, the US Justice Department says it will not reopen criminal investigation into CIA torture". "A confrontation between the Obama administration (Democrats) and his critics (Republicans) over making the report public and the danger of its subsequent fallout in other countries has begun," states Iranian daily Vatan-e Emruz. Iranian media in general use the word "shocking" to describe the findings of the Senate investigation. "Torture, surveillance, shooting - the three pillars of American human rights," reads the front-page caption of Tehran's Hemayat. "It puts a question mark over… American human rights," the paper adds. Most of the press in other Middle Eastern countries, however, do not comment on the CIA report, preferring instead to focus on the results of the Gulf Co-operation Council summit in Doha. Praise for what some analysts see as brave step by the White House to reveal torture committed by its intelligence agency can be found mainly in the media of countries that are US allies. "Obama's admission of guilt is a sign of national greatness," say a commentary in the German daily Bild. "The country that cuts itself loose from these crimes deserves the highest respect. America's conscience has gained a victory," the article declares. For Frankfurter Allgemeine Zeitung, "the public airing of scandals and errors is one of the basic pillars of democracy". The newspaper argues that this is particularly important in the case of the United States. "The country that sees itself as a moral world power needs such steps to win back the confidence that the Bush administration squandered with this part of its 'war against terror'." An article on Radio France Internationale's website, however, terms the Senate report "a complicated exercise in democracy", while the French press openly condemns the methods used by the CIA. The United States faces a "dark era" in its history, announces the daily Le Monde. "Lies and torture," adds L'Express in its headline. In Spain, an editorial in El Pais argues that after the revelations, the US can no longer present itself as "a beacon of freedom". 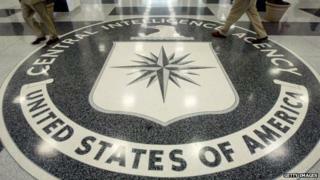 CIA report: Who are the unlikely interrogators?